"...the embracing of partners -- the female only half dressed -- is absolutely indecent; and the motions -- they are such as may not be described, with any respect for propriety, in a family newspaper. Suffice it to say that there are certain houses appropriate for such dances; but those houses have been closed by law." COME TO THE RHYTHM CLUB THIS WEDNESDAY!!! It's time for another swingin' night at the Rhythm Club, and this week we get to celebrate the birthday of our own beloved Rusty Frank!!! 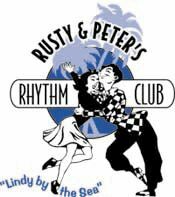 Rusty's actual birthday was Monday, but in the swing community, the fun lasts all week long, and we're having the big bash at the Rhythm Club!!! Please make sure to join us for this special evening of fun, food and frolic and what we expect will be a birthday dance to remember for Rusty. Though Gunilla is far off in Scandanavia, we will be thinking of her! If you know of any other birthdays this week, please let us know so we can get them in on the fun as well! 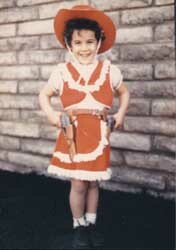 Rusty in her favorite swing dance outfit! So come down this Wednesday night and spend an evening among friends at the Rhythm Club.. We've got some of the best DJ'ed swing music anywhere and a reputation for being the friendliest club in Southern California! Add a 2,800 square foot dancefloor and some pretty powerful air conditioning, loads of parking and a mere $6 cover charge and you've got yourself a terrific evening. And it's open to ALL AGES!!! NEW SERIES OF CLASSES BEGINS THIS SUNDAY AND MONDAY!!! It's hard to believe it, but a new series of classes is about to begin at Lindy By The Sea, and we can't wait!!! Every series brings us so much joy, meeting new friends and dancing with returning students and pals from previous classes. Make sure to plan now for the new classes and tell your friends and family...word of mouth is still the best promotion in the world! This Monday night's Featured Class is "The Big Apple!" Originally, the Big Apple was a non-partnered dance done in a circle, with a "caller" shouting out steps for everyone to do, such as "Suzy-Q", "Truckin'," or "Applejack." 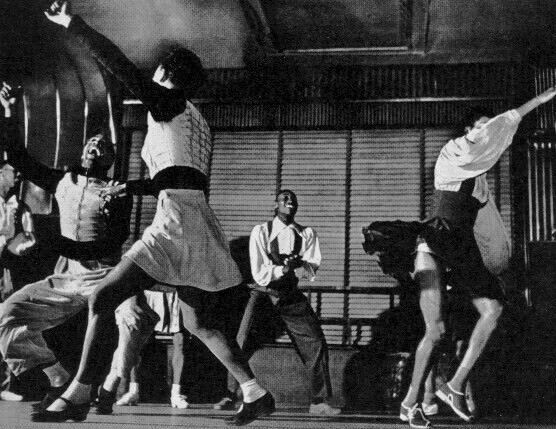 Then in the 1940's the legendary Frankie Manning set a choreographed Big Apple routine for Whitey's Lindy Hoppers, the premier lindy hop performance group in the world. We will be teaching this choreographed routine in the class, and it is LOADS of fun. It's always one of our most-loved classes, and people are always asking us when we will be offering it again! We only do teach it about twice a year, though, so get in on it now!!! 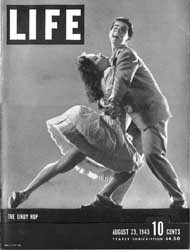 It's filled with terrific steps and moves that will help your style and movement in your lindy hopping!!! SPECIAL FOR LEVEL 4 STUDENTS: If you are a Level 4 dancer, we have a great offer -- you can go through any of our Level 1, 2, and 3 classes for $10 per series! Yes, that's right, just $10 for an ENTIRE series. What a fantastic and economical way to brush up on your technique, get those little critical details you may have missed in the all the excitement first time round, and meet new dancers. You can even go through as an "opposite" (leaders, you can go through as a follow, and follows as leaders -- this is also terrific for improving your dancing, as it gives you an insider's look at the other side and helps you do your job much better). 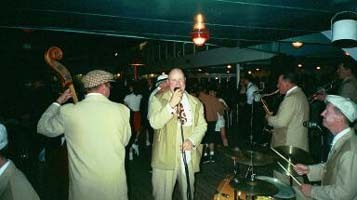 The Swing Session -- Live on deck at last year's Lindy Cruise! Join us and twenty-eight of our students!! Hope to see you onboard!!! We just wanted to include this picture taken at the last Satin Ballroom dance two weekends ago. 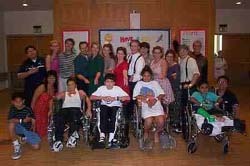 It shows Rusty and Peter, along with their dear friends Jann Olson, Jean Veloz and Baerble Kaufer. As it happens, Baerble, Jann, Jean, and Rusty all celebrate their birthdays in February. How cute!!! FANTASTIC END OF SERIES PARTY!!! Sunday night saw another End Of Series Party, and boy was it fun!!! More people than usual turned out for a wonderful night of music and dancing, all for FREE! Rusty and Peter showed some terribly embarrassing footage of themselves as beginner dancers (Rusty in a ballet recital, age 8 -- Peter in a swing dance contest after a full year of dancing) and it was HYSTERICAL! It certainly did a fine job of proving to those who may have had doubts, that Rusty and Peter are definitely not natural dancers who have some sort of inborn knack!!! We hope that it gives all our students faith that they WILL become fine dancers!! There was also a big birthday dance for Debbie Perry, whom we hadn't seen in a while, and lots of great cookies provided by Alaina and Melissa for Rusty's birthday! (You could even write a special message on the cookies with these clever edible ink pens!) A bunch of fine dancers made the trip up to the party from Orange County and had a ball dancing with everyone! (We hope to see more of them soon!) All in all, a great time was had by everyone, and we hope to see YOU at the next party, coming your way on March 24th!!! $90,000 RAISED FOR THEIR HEART DEPARTMENT!!! 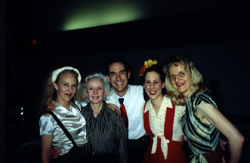 After the fun of the Tap Dance and Lindy Styling workshop, about a dozen Lindy By The Sea students joined Rusty and Peter on a trek up to Ontario to dance at a fundraiser for a local hospital! The live music was provided by none other than the Jumpin' Joz Band (in very fine form!). Rusty and Peter led off the dancing festivities with their two song-and-dance numbers. Then the swing dancers dazzled the crowd with their Lindy Hopping before going out to the audience and escorting the attendees onto the floor for some great dancing! The evening was a huge success, with a Shim Sham and a Jitterbug Stroll thrown in for good measure, and just LOADS of great dancing. We want to thank all those who came out to help on this event, and we hope to do lots more of this soon!!! SWING.CH -- If you are beginning to make plans to travel globally anytime soon and fear that there might not be anywhere for you to swing dance in Sweden/Switzerland/Singapore/Wherever, fear not!!! The Swiss Swing Dance Society is here to help! Like the internet equivalent of the St. Bernard rescue dog with a barrel of hooch on it's collar, the SSDS provides you with the most comprehensive "links" page in the world! 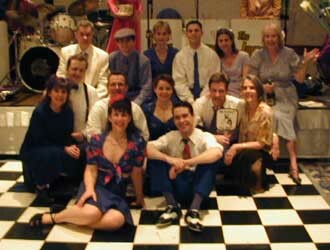 Every major swing group from around the world has a link on this site, organized geographically for your convenience. So go ahead and book those tickets to Finnland or the Netherlands! We've got you covered...just click on http://www.swing.ch and go to their "links" page. And don't forget to browse the rest of the site, too! There's lots of fun stuff to be found! *Wondering what the heck a "gate" is? This was a phrase popularized by 1940's comedian, Jerry Colonna, who would holler it out every time he was introduced on the Bob Hope radio program. 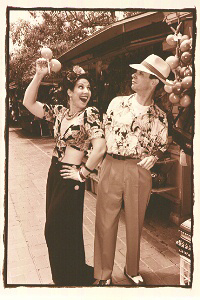 It was a friendly salutation to a swing cat (dancer or swing music enthusiast).